When Sitting Spiritually founder Martin Young first started making swing seats, he had a distinct interest in Feng Shui. The need for soft corners, swirls and curves influenced his ideas right from the outset. This is epitomised in the Kyokusen Swing Seat, the distinctive curved oak creates a stunning frame that remains one of our most popular swing seats. We have always tried to produce something that is not just nice to look at, but something that is a joy to sit on. Our designs are inspired by our customers. The range has developed over the years by being asked by customers what we can do and whether we would consider a particular design or feature. The Day Bed for example, was the result of a garden designer asking us to design and produce one specifically for them. Working with them and their brief, we moulded the idea in to what we thought was a fantastic design. Once we had made it, it generated a lot of positive feedback and subsequent requests for more. Since then we have introduced it to our range, to the extent that it was our flagship product at the RHS Chelsea Flower Show where we regularly attend. The additional features that have become synonymous with our garden furniture range like drinks shelves, inset ammonites, carvings and inscriptions are all a result of customer requests. We’re proud that our range is inspired by customers; we are always listening to feedback and shaping them in to new ideas. Why do we choose to build our Swing Seats with timber? When looked after properly, wood improves with age and doesn’t deteriorate over time. 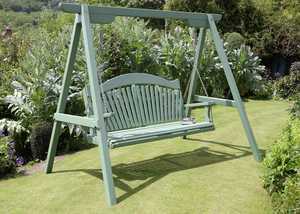 Take any of our oak swing seats for example; when it first arrives it’s a wonderful tan colour. Over time and with the British weather taking it’s toll, it morphs itself in to a lovely and majestic silver colour. It’s the same with the Western Red Cedar we use. Providing you keep it clean and look after them, wooden swing seats will always improve with age. Wood is a natural, softer material to create swing seats with compared to the likes of metal or plastic. What difference does the wood actually make? We use Oak, Western Red Cedar, Pine and Accoya. 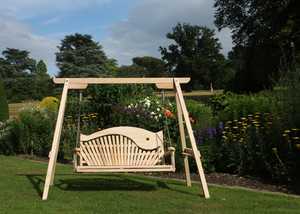 Accoya in particular is an interesting one as it is an engineered and totally rot-proof wood, which naturally sounds ideal for garden swing seats. However, when we tried to paint it we found it didn’t have that perfect finish that we insist on for our seats. We therefore decided to keep it just as a natural unpainted finish which has proven popular with many people. Each wood has it's own distinct features that make it unique. Oak is the hardest, the toughest and has the greatest impact resistance – but it’s also the most expensive. Western Red Cedar is a durable softwood commonly used to make cedar shingles out of for roof tiles. We’re always open to trying new materials or types of wood for our swing seats. Walnut for example is beautiful timber but you can’t use it for outdoor garden furniture. We have a strong belief in working with local businesses and local people and focus very much towards that. We have 5 joiners who all work under license for us within about a 5 mile radius of our base in Lyme Regis, Dorset. Those haven’t changed in over 5 years now. One of the fortunate things about living in the South West of England in this little part of the world is there are three main industries: agriculture, tourism and building. Therefore, if you’re in building and running your own joinery business, you have to be good at it. 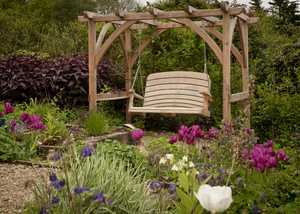 This provides Sitting Spiritually with some fantastic access to local tradesman and businesses to make our swing seats. We're immensely proud of our local roots and will always seek to keep our business here in the South West. Our ethos is to develop an outstanding local team of craftspeople and suppliers that are totally committed to enhancing the brand that is Sitting Spiritually. Several studies have shown that when you buy from an independent, locally-owned business, rather than a nationally-owned business, significantly more of your money is used to make purchases from other local businesses, service providers, and farms — continuing to strengthen the economic base of the community. Small and independent businesses such as Sitting Spiritually are at the heart of our communities. The economist and author Michael Schuman highlighted this by saying that when you support local business ‘control moves from the boardrooms of distant corporations and back into the community where it belongs’.